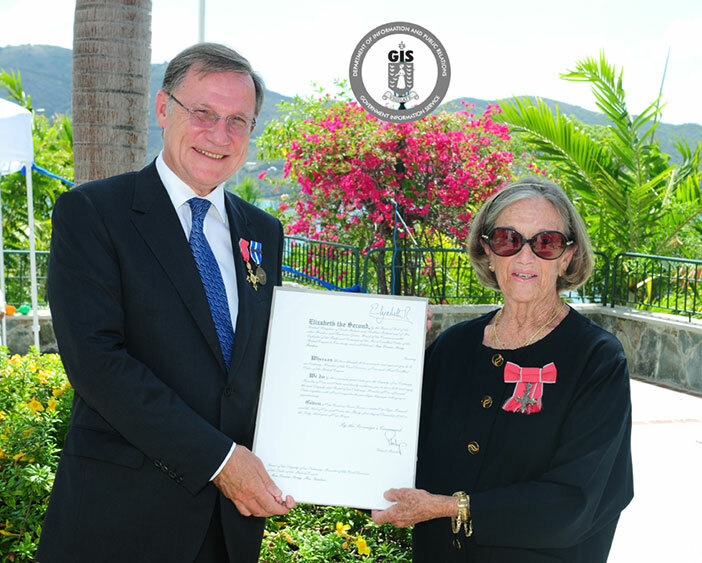 Former director for the Kids and the Sea (KATS) Programme Mrs. Ann Louise Avery Gardner is the Territory’s newest recipient of the Member of the Order of the British Empire (MBE) award from Her Majesty the Queen. His Excellency the Governor, Mr. John S. Duncan, OBE at an investiture ceremony today, presented the insignia and the Royal Warrant to Mrs. Gardner in a gathering of family, friends, past honorees and Government officials. The Governor said it was a great pleasure and privilege to bestow the honor on Mrs. Gardner and spoke of her unfailing energy, enthusiasm, infectious sense of humor and service to the Territory. He added that Mrs. Gardner was a major fundraiser for Fort Charlotte School for the mentally and physically challenged children of the British Virgin Islands. Governor Duncan also reminded the audience of the bumper sticker, with the slogan “Hands across the Ocean” she started with the BVI Red Cross and helped to raise $44,000.00 for victims of the 2004 Indian Ocean Tsunami. Mrs. Gardner’s commitment to her family was also highlighted by the Governor who said her work is a fitting tribute to her personal family tradition. Governor Duncan said Mrs. Gardner is following in the footsteps of her father who served with distinction in World War Two with the American Red Cross. He helped thousands who suffered at the hands of totalitarian regimes in Western Europe, from refugees to concentration camp prisoners. Governor Duncan said, like many Governors before him, he has been on the receiving end of Ms. Gardner’s kindness and was very pleased to continue last year’s tradition when he hosted a Christmas party for those with special needs with her assistance. The Queen’s honours system recognises individuals who have made achievements in public life, committed themselves to serving and helping their community, or have been outstanding at what they do and have stood out as an example to other people.